What Can I Do if a Customer Just Won't Pay? In the case that you have a customer that refuses to pay for a good or service, you have one recourse: take the amount off of your sales and take the tax deduction for the bad debt. Before you can take a deduction for bad debts, you must be using the accrual accounting system. Most small businesses use the cash system. 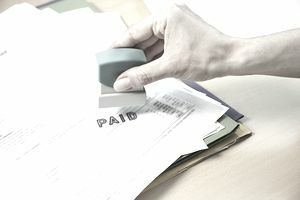 Under the accrual system, you can record a sale at the time you invoice the customer, but if you don't get paid you may end up with an uncollectible account. Let's say you are using the accrual system and you want to collect the money or take a tax deduction for the amount. First, be sure you understand and apply the laws relating to consumer credit and collecting on bad debts. You don't want to have to face a lawsuit from an irate customer or be accused of harassment. During the year, you have accounts receivable which you collect...and some receivables you are having trouble collecting. At the end of the year, run an Accounts Receivable Aging Report to see who has not paid you for a long time and who you have tried diligently to collect from. If the customer is no longer active or has stopped paying, you may be able to cut this customer's balance from your total sales, to reduce your income. Add up all the bad debts you want to write off. Be sure you really want to write off these debts. If you receive the money from the customer later, you will have to reverse the write-off and declare the payment as income. Review the list with your tax adviser and add up the non-payers. Then you can claim a deduction for the total amount of your bad debts, on your business tax return. If the Customer Pays Later: Sometimes customers who you thought would never pay will come back later and pay you. You will have to count this income, and your accountant will have to account for the reversal of the bad debt on your tax return. Keep your accounts receivable aging report to show how long these debts were outstanding. If you hired a collection agency, keep the documents or contract relating to this transaction and any correspondence that shows the collection agency's efforts to collect. Record any information that leads you to believe these customers will not pay or that you have reached a dead end in your collection efforts, such as a bankruptcy notice in a newspaper, or a letter that has been returned to you as undeliverable. In other words, keep any record relating to this bad debt, to substantiate your write off to the IRS. What is the Fair Debt Collection Practices Act (FDCPA)? What If You Lose Business Records in a Disaster? LIFO vs FIFO for Inventory Accounting - What's the Difference?